The tricky thing here is how much hot red chilli to add. Chillies or chilli powder can't be added as salt can, it requires cooking, so difficult to adjust it while cooking. I added 4 chillies, 1/2 teaspoon red chilli powder, along with the 2 tablespoons of sambar powder (which also has the chilli spices), and it turned out a bit on the hot/spicy side. So for the recipe below, I removed the 1/2 teaspoon chilli powder, though if you like things hot, feel free to add it. Tamarind - soak 1-2 tablespoons in 3/4 cup warm water for 30 minutes then filter it out to get tamarind juice. Or use 1 tablespoon tamarind paste and add it while cooking. In parallel, cook the sambar. Some recipes call for just boiling all the vegetables with the spices, while some saute vegetables and then proceed to boiling. I prefer the latter, though I'm told it probably makes no difference in the final taste. This happens to be a Punjabi dish, and my recollection of eating this in Maharashtra and Gujarat is in a combination of Rajma, Rice, and bibaDa. bibaDa (बिबड़) is a Jowar pappad (ज्वारी, sorghum pappad) - certainly can't get it anywhere in the US, nor it is easily available in India, have to travel to interior towns in Maharashtra to find someone who even knows about this. Like pappads, it is a crispy snack, can be baked or fried. I prefer the baked variety - put this in a toaster oven, watch it very carefully, one or two seconds more in the toaster oven, and it will burn completely to black. Cooking time in a toaster oven is around 30-60 seconds - keeping a watch all the time. It has a smoky, crispy taste, and closer to a tortilla chip than to the more popular chickpea pappads. Rajma (राजमा) is kidney beans - an amazing store house of good nutrients - high soluble fiber, fat-free high quality proteins, minerals, and lots more as a search on the web reveals, and in the curry dish below, with rice and bidaDa, it tastes great too! Had enough of rich buttery high-fat foods, loaded up on red-meat and sugary snacks, and now looking to fix everything wrong in your body? Have no fear, oats to the rescue - it has soluble fiber to help reduce harmful cholesterol. So, fix yourself up with a regular serving of oats. Additionally, filling yourself with oats means less space in your stomach for all that other stuff that you crave but is not good for you. Rolled oats, as well as instant oats, in my opinion, don't taste very good - soggy, no texture, insipid food. Steel-cut oats are a world apart - they have a hearty taste, nice chewy and nutty texture - good taste, and good for you - and there is no catch! Steel-Cut Oats are whole grain groats (the inner portion of the oat kernel) which have been cut into two to three pieces. A popular brand is McCann's Irish Oatmeal. But for those eating this regularly, look for steel-cut oats in your local bulk-grocery store - bulk-bin purchase, in stores such as Whole Foods, will get you 5 times more oats for the same price. There are many ways to cook steel-cut oats, here's the way I cook them. Other alternatives for faster cooking involve soaking overnight (in hot water - in cold water it does not help at all), or using the pressure-cooker. Each quarter- to one-third-cup dry steel-cut oats is one serving, around a cup of cooked oats. Time: 40 to 60 minutes - but varies with size of the cut - larger grains take longer time. Just be very careful, overcooking makes everything too mushy and very easy to overcook in a covered pot and under-cooking oats taste too raw. Bring the water to a boil in a covered pot. Good to use a glass cover to watch when oats start to boil over in the next step. To the boiling water, add all the oats. Pot should be watched when boiling - use a large pot, and lower the heat to medium, to prevent it from boiling over. There are literally millions of chicken curry recipes out there. The key to this one - slow cooking. Found this in the book by Khalid Aziz, titled "Step by Step Guide to Indian Cooking". Modified it a lot, but kept the slow cooking part. Heat Oil, when hot, add black mustard seeds. Use electric chopper to chop all the onions, leave one cup of onions aside, and then add the chopped onions, with the cumin seeds, to the frying oil once the mustard seeds start popping. Add 1 cup of onions, roughly cut ginger, and garlic (skin removed) to the electric chopper, and chop this mixture real fine. Once the frying onions are nearly transparent, add the finely ground onion/ginger/garlic mixture to the frying pan, cook for 5-10 more minutes. Then add the dry spices - turmeric, garam masala, cinnamon sticks, coriander seeds, chilli powder, all as needed. Cook for a minute or two, and then add chopped tomatoes. Cook for 5-10 minutes, all this on medium heat. Then add the chicken pieces, cook for 3-5 minutes, then lower the heat, add water as much as needed to make the curry, and cook on low heat for 60-90 minutes - more if using chicken on bone (2-3 hours). 1) Add half to one cup of plain yogurt after adding the chicken. 2) Add chopped spinach - during the last 30 minutes of cooking. or less, cover and let it cook - 10-15 minutes. Heat oil in a frying pan, medium heat. Add green chilles, onions, cook over medium heat, 2 minutes. Onions barely soft at this time, not fully cooked. Add garam masala, cook for a minute more. Add tomatoes, cook for 3-4 minutes, may increase heat a bit here. Use only a small amount of diced tomatoes - around 2-3 tablespoons - to prevent any water from remaining in the dish at serving time. In a bowl, break the eggs, add salt, milk or cream, fresh ground pepper (lots! ), and whip this together. Add this to the frying pan, cook over for 1-2 minutes over medium heat. Stir and scramble the mixture twice or thrice, turn off heat just before the eggs are cooked - they will continue to cook in the pan. At the end, the eggs should be fully cooked, but still moist. Garnish with chopped cilantro leaves. Add a tablespoon of shredded cheddar, if desired. Serve with bagels topped with cream cheese. At the end, onions should still have a crisp snap to them, and eggs should be moist, not too firm. Wash sabudana in water for a minute, drain nearly all of the water, level should just cover the sabudana, and leave in covered vessel for half-hour. Then drain all water, and leave covered for 4 hours or overnight. When done soaking, no liquid should be left, and all the grains should be soft but not mushed together - pressing between fingers should find no hard material in the middle, should be soft all the way. The name makes it sound scary-spicy hot - but it isn't. Imagine a yellow lentil soup, with spinach, and peanuts. Yum-yum-yum. Not spicy-hot at all, the mirchi is to taste only. - heat oil, add mustard seeds, when they start popping add onions, cook until soft, add garlic, cook for a few more minutes. Add garam masala, cook for a minute, then, add this mixture to the spinach/daal. Serve with chappati, or fine with rice too. Comfort food: Yellow lentil soup. Eat with rice, or with chappati. Wash toor daal, mix all the above, bring to boil, cook until yellow lentils are really soft, around 30-40 minutes. 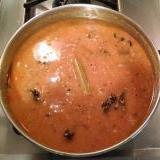 At end, use back of big spoon or spatula, to blend the lentils in the water, for a thicker consistency. To eat, pour over rice, mix, and if not watching cholestrol, add ghee, or butter! Can also be eaten with chappati. Variation: add a tadka or phodni to the dal. Heat oil, add mustard seeds, when popping add cumin seeds, chopped onions. Cook until onions become transparent, add spices - cumin powder, coriander powder, as needed, then add chopped tomatoes, cook for 5-7 minutes. Then, add all this to the dal.